Draymond Green looks to follow the lead of rival LeBron James on and off the basketball court, claiming any NBA player would be "crazy not to". 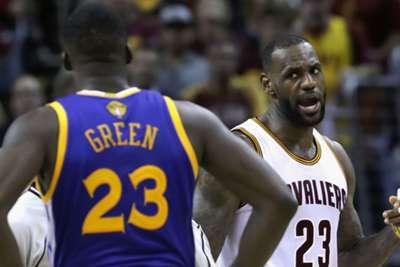 Green and James were on opposite sides of an intense rivalry between the Golden State Warriors and the Cleveland Cavaliers, with the former suspended for Game 5 of the 2016 NBA Finals after the pair clashed. But with Cavs great James having left for the Los Angeles Lakers, setting up further regular-season clashes against the Warriors, the Golden State forward acknowledged respect for his adversary. 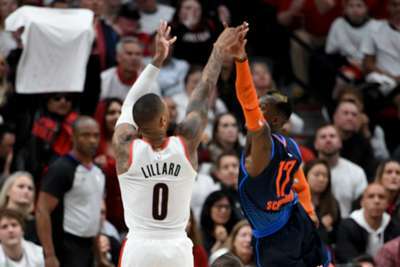 Green said: "If you look at what LeBron has done over his career - the way he's carried himself, the way he's gone about his business off the court, the way he takes care of his body - I think he's laid the blueprint, not only for myself but for many athletes for years to come. "We do battle on the floor. I've been that way my entire life, it doesn't matter who I play against, I could play against my blood brother and, when we're on the floor, I want to take your head off. It's just the nature of the competition. "But off the floor, he's definitely a guy I look to and watch a lot of things he does. He's been so successful on and off the basketball court. "And I think honestly you'd be crazy not to follow the blueprint. So many times in life someone shows you: 'Hey, this works.' And we want to deviate from that and give it all a twist - and that twist ends up ruining it. "So I watch a lot of things he does, he's a friend of mine and a guy I talk to and just try to take as much as advice as I can from."